September may as well be nicknamed “Quick and Easy Dinner Ideas Month,” because let’s face it: that’s what everyone is looking for. 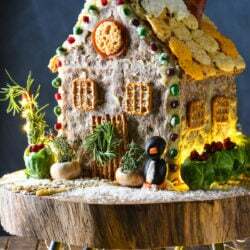 By the time October hits, we might be in the swing of things enough to focus on some long-simmered stews and magnificent baking projects, but for now, let’s just get dinner on the table as quick as we can. I know that it can be hard to find time to cook dinner from scratch, but I’m a big believer in letting the grocery store help you out a little bit. 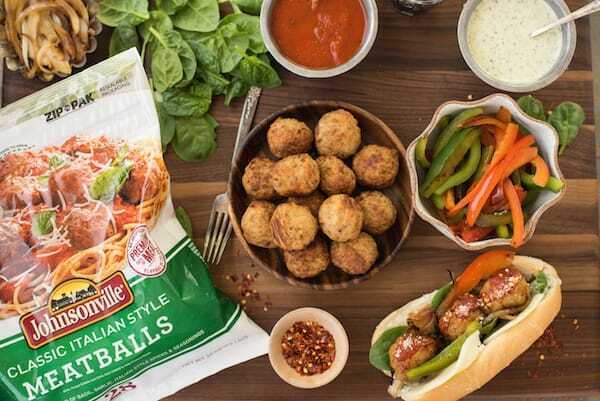 Combine some recipe-ready items like Johnsonville® meatballs with a few things you’ve prepared yourself, and you’re good to go. These meatballs are found in the frozen aisle, and are made with premium cuts of meat, with no artificial flavors, colors or MSG added. They’re totally ready to use – just add frozen or thawed meatballs to sauces, pastas, soups or sandwiches. Speaking of sandwiches, who doesn’t like a good meatball sub? 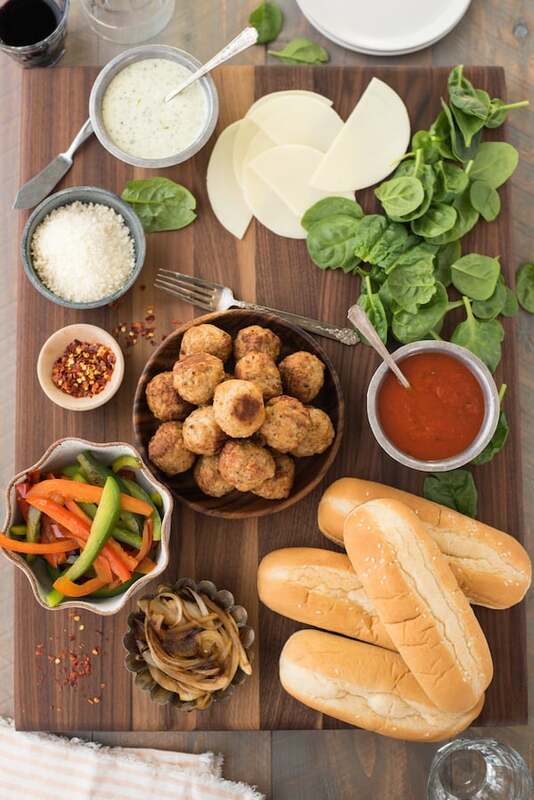 Since I’m all about party platters, I thought it’d be fun to load a big cutting board with all the fixings for fancy meatball subs, and let everybody build their own adventure. 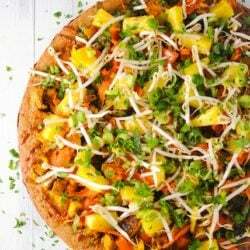 Feel free to use whatever toppings and sauces you prefer. Here, I’ve included sautéed bell peppers and onions, marinara sauce, pesto ranch dressing, spinach, Provolone and Parmesan cheeses, and red pepper flakes for spice. For more information about Johnsonville®, please follow them on Facebook and Twitter. Check to see if Johnsonville® Meatballs are available in your area by visiting http://www.johnsonville.com/products/locator.html. Meanwhile, heat medium nonstick skillet over medium-high heat. Add 1 tablespoon oil, green pepper and red pepper. Cook 4 to 6 minutes or until softened. Transfer peppers to small bowl and repeat with remaining 1 tablespoon oil and onion. Transfer softened onion to separate small bowl. In small bowl, stir together ranch dressing and pesto. 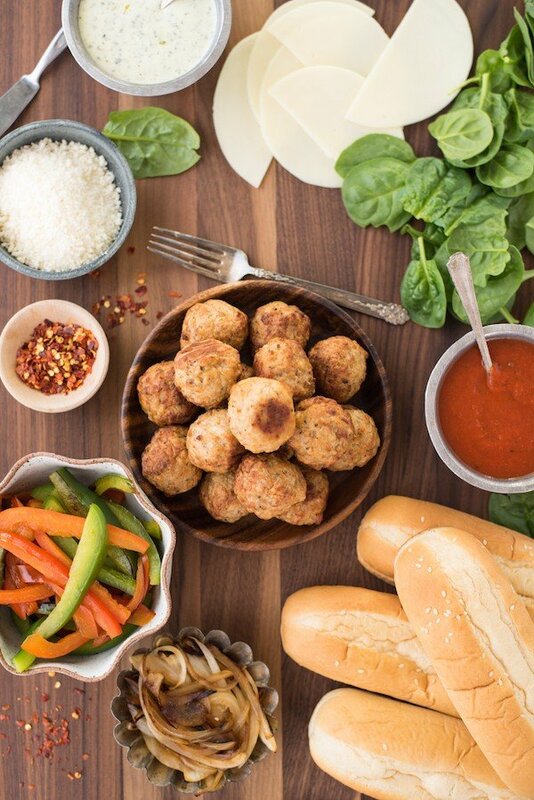 On large cutting board or platter, arrange hoagie buns, Provolone cheese, spinach, marinara sauce, Parmesan cheese, red pepper flakes, meatballs, bell peppers and onion. 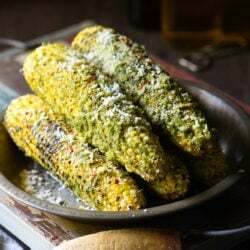 *Please click here for a recipe for homemade Pesto Ranch Dressing. I love those meatballs! What a great dinner idea. Thanks Dorothy. The meatballs themselves are so darn flavorful that most of the time, I just eat them on their own! My husband just walked by and said “oh are we doing that?” So I guess I’m doing this. Thanks for the idea! Off to make meatballs. 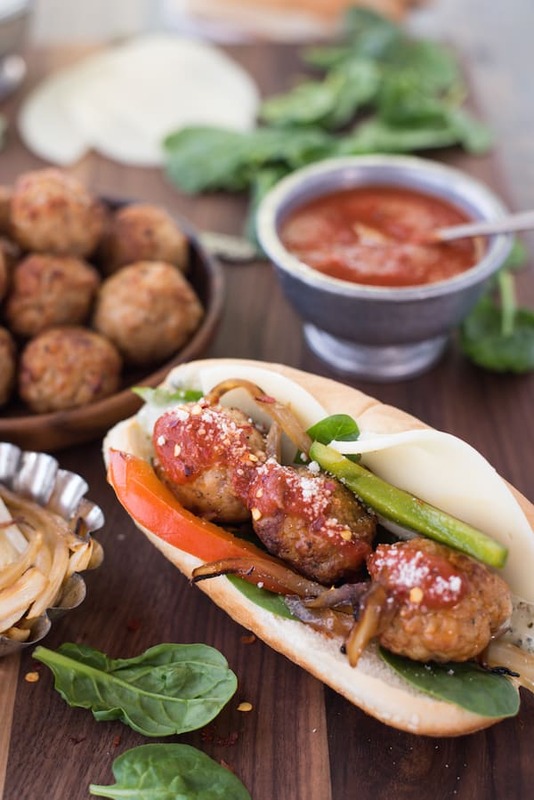 Meatball subs are my kids’ favorite! I need to do this for them soon! Thanks Amanda! Kids would love this, for sure.